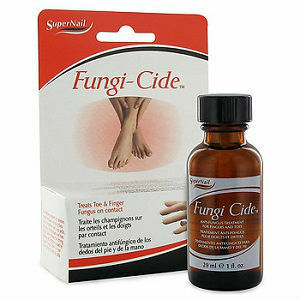 SuperNail Fungi Cide is used to treat common toe and finger fungus on contact. This product has been enriched with Aloe Vera and Vitamin E for healing, while it also contains Benzocaine to sooth painful areas according to the vendor. The product container comes with a brush-on applicator. According to the vendor source, this product comes with Aloe Vera, Vitamin E and Benzocaine. The vendor source does not provide any information on the amount in milliliters of these ingredients. The product comes in a 28 ml container (1 fluid once). The vendor source provides no information on product dosage or application beyond the fact that the product comes in a container with a brush-on applicator. The vendor source does not contain price information. The vendor source does not provide any information on product warranties or returns and contains no product reviews. The vendor source contains very little information about this product. Anyone considering purchasing this product should contact the product vendor (the vendor source contains a feature to use to submit questions) for basic information about product price, guarantees and product return information. Jack Stevens	reviewed SuperNail Fungi Cide	on March 30th	 and gave it a rating of 3.